How Do Students Respond to Microlearning? 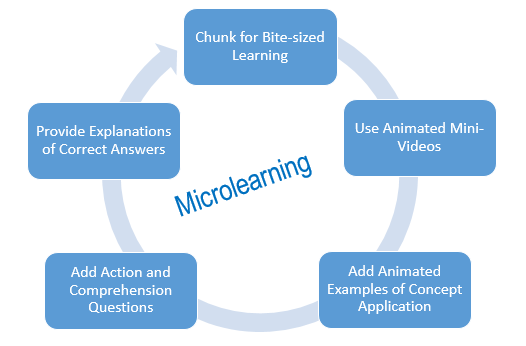 What is Microlearning? Why Should We Use It? Microlearning is a way of teaching and delivering content to learners in small, very specific bursts. The learners are in control of what and when they’re learning. Microlearning allows for better learning. It helps the learner focus on essential information needed to perform a task and not be distracted with less relevant content, as learners can be easily overwhelmed by the volume of content pushed at them. Research consistently confirms that learning develops faster if concepts are taught explicitly and if students can focus on what truly matters. One type of microlearning we have found to be extremely effective is animated microlecture videos. Using animated videos for delivering microlectures grabs learners’ attention and makes the subject matter more digestible. Student learning can be further optimized by creating animated examples of how the concepts can be applied in real-life situations. In addition, comprehension questions augmented with the program feedback that explains the correct answer allow students to retain the information. The formative evaluation of these modules was conducted over a period of two trimesters (August to December 2015 and January to April 2016) with a total of 187 students. We analyzed the students’ perceptions of the modules’ usability features (e.g., pace of audio presentations, ease of navigation, and layout), as well as of the cognitive support and effectiveness of the modules. Students were overwhelmingly positive about their statistics online learning experiences. Suggestions for improvement included having more multimedia microlectures, showing more examples and calculator tutorials, and asking more comprehension questions in the modules. I had a terrible time in previous math classes and dreaded taking this one. As it turns out, this class has not been bad at all. The interactive lectures make a difference for me. Throughout this course, the tutorial videos have helped me immensely with initially learning the concepts for each week. Each one has been consistent and I know what to expect when I open one up. I think these are really great learning tools. The material and delivery were very straightforward and accessible. Having taken the old course, I found this new course is far superior in ensuring students ‘get’ the material! I learned a lot! Easy set up! The student can learn without regular meet sessions using the multimedia and Connect assignments. My learning experience with this interactive multimedia lecture allowed me to have a better understanding of the weekly subject of study. It is also more flexible with my schedule. If there are any questions or if I need further understanding, I can always go back and re-listen to the lecture. Being a person that doesn’t like online courses due to my anxiety, the interactive media gave me a chance to sit back relax take a breath and learn. I felt that with the ability to play back sections and jump to different sections within a click put my anxiety to rest. Personally, I like the fact that I could log in to MyFranklin and watch this instructional videos during my lunch hour at work and cover some new material. I really liked the ‘Check Your Understanding’ questions at the end of each section. I liked them because they utilized the concepts from the sections without using the exact example used in the section. Using microlearning for this statistics class has really had an impact on our learners. What are some ways you could incorporate microlearning into your course designs? The paper reporting the results of the course redesign is scheduled for publication in the Journal of Educational Multimedia and Hypermedia. Dr. Natalya Koehler is an instructional design faculty at Franklin University in Columbus, OH. She received her doctoral degree from Iowa State University.